Is your tyre deflating over time? Have you got a slow puncture? Has your wheel got a flat spot? Is your wheel egg shaped? Is your alloy buckled or twisted? Don’t panic, your wheel can be repaired. Everything is repairable; the question is, is it cost effective? Using our state of the art wheel straightening equipment we can take an unserviceable wheel and turn it into a serviceable wheel for a fraction of the cost of replacing with new. Give us a call to book an appointment to bring your wheel in for repair. 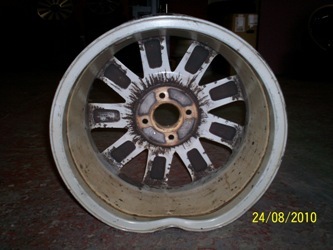 Example of a repairable buckled wheel.